My 5th graders in CA are looking to connect with classes east of the Mississippi River for Mystery Skype. If you’re a teacher and interested in scheduling one with us in the next few weeks, sign up here! Mystery Skype is a fun and engaging way for students to learn geography and broaden their worldview. It also provides students with an opportunity to sharpen interpersonal and critical thinking skills. My students love it! I’m happy to explain how it all works if you’ve never done it before. If you know a teacher who might be interested, please share this with them. We are open to scheduling with any age group and size. What better way to learn than through play? Want to encourage your students to think outside of the box and utilize their problem solving skills? Read about my “Not-a-Box” challenge and consider doing it with your kiddos. Last week, my 5th graders were innovators. It began with reading the picture book Not a Box . After receiving a little inspiration from the book, my 5th and 6th graders were presented a 25 minute challenge. With limited supplies, they had to think “outside of the box” to create their own “not a box”. Use your box to create or invent something. You may use as many or as little of the supplies provided. Supplies provided: construction paper, tape, glue, scissors, yarn. You may only use the supplies provided. Note: Students were asked to bring a box to school ahead of time, but they weren’t told what it was for. They were told the box could be as small as a jewelry box or as big as a refrigerator box. My students were encouraged to be creative and they delivered! Many came up with something original, an invention of their own. After the allotted time expired, we turned the room into a museum. Students were given a piece of folded card stock on which they wrote the name of their creation to display in front of their box. The students then took took turns touring the museum and showcasing the “not a boxes”. This performance task provided students with a fantastic opportunity to sharpen targeted skills. You can use this video read aloud of Not a Box if you’re unable to purchase the book. Of course you do not have to present this activity as a timed challenge, but for me, it added to the excitement and required students to use even more of those problem solving and decision making skills that some of my kiddos so like to keep locked away. My students do not have a lot of timed experiences so I felt it was a needed addition. Here are a few pictures, shared publicly through the school Facebook page, that show what the activity looked like in action. Students are hard at work as they start on their “not-a-boxes”. The on-the-go-case can transport items from home into the briefcase. Did you forget your homework? No problem, as long as you have the on-the-go case with you. Hit the homework button inside, close it, and when you reopen it, there it is! Hungry? Type in any food along with the quantity you’d like delivered, and this gadget will whip it up for you. Your flowers will grow better than ever when you use this garden planter. It releases a secret potion that keeps your plants alive and strong. Keep track of your Mystery Skype visits with a Mystery Skype wall map in your classroom. Last year, I wanted to keep track of my 5th grade Mystery Skype visits with a large wall map, but I didn’t want it to be a costly expenditure. I created the above map (3ft by 2ft) by using just what was available in my classroom. As we visited different states, we highlighted it on the map and added a flag, labeling the city and state. It was an easy way to keep track of our visits, and we were easily able to add multiple flags within the same state. Click HERE to print a large map. I chose the 3 x 3 “USA continental” map and then drew an outline of Canada and Mexico. I then printed Alaska and Hawaii separately and added them to the map. The link I provided also offers a printable USA map with Alaska and Hawaii included if you’d prefer it. I chose the former because it allowed me to include bodies of water and adjacent countries. Regular school glue will dry white, and I didn’t have any problems with it holding the eraser flag while it hung on the wall. Last year hundreds of students used the Dr. Seuss WebQuest I created for Read Across America Day. I posted this WebQuest on the blog for the same reason I post everything else – I hoped someone besides myself and my class could utilize my work. Well, I’ve been blown away by its popularity, and I’ve updated it so that it can be better utilized by teachers and classes outside of my own. I’ve received over 300 survey submissions, and it’s been on my to-do list for quite some time to update the webquest to include survey results, making it more engaging and fun. I finally had time to do so this week. Now, when you submit a survey, you’re led to a results page. Also, since last year, a few links have gone by the wayside. They’ve either been replaced or removed, so everything is fully functioning and ready to go for this year’s Read Across America Day. It’s time for your class to complete the Dr. Seuss WebQuest (pictured below) and get to know the writer, poet and cartoonist known as Dr. Seuss better than ever. They will explore his books and characters, and even create a Dr. Seuss inspired character of their own! Click HERE to begin. Purpose: Students complete a WebQuest to learn more about Dr. Seuss and his books. They then use this to inspire them to create their own Dr. Suess characters. This WebQuest is motivating to students as it allows students to explore and learn at their own pace. Students will use online resources to learn about Theodor Seuss Geisel, the writer, poet and cartoonist known as Dr. Seuss. Students will explore books written by Dr. Seuss, discovering new books and reflecting on personal favorites. Students will create their own imaginative Dr. Seuss inspired character. Students exercise technology skills to compile learned information in a Microsoft Word document. Students will: create a bulleted list, insert a table, use shading to fill table background, use text alignment tools and insert headers. Here is a picture book for you to consider for your upper elementary classroom, as well as an activity to drive the powerful message of the story home. About the Book: Each Kindness is a picture book about a girl, Chloe, who is unkind to a new student named Maya. One day, Maya doesn’t return to school. After a lesson about kindness from her teacher, Chloe recognizes the impact of her choices to be unkind. She hopes Maya will return so she will have an opportunity to be friendly to her. But Maya doesn’t return. And Chloe doesn’t receive another chance. Instead, she is left only with the memories of her unkind choices. Teaching Point: This book doesn’t have a feel-good, fairy-tale ending, but it shares a wonderful message: We don’t always receive a second chance. Sometimes we have to live with our choices and we don’t get a do over. On Jacqueline Woodson’s website she shares the following explanation for why she wrote this book: “At some point in our lives, we are all unkind. At some point, we are all treated unkindly. I wanted to understand this more. I think too often we believe we’ll have a second chance at kindness – and sometimes we don’t. I do believe, as Chloe’s teacher, Ms. Albert, says, that everything we do goes out, like a ripple into the world. I wrote this because I believe in kindness.” This is a truly great message that students are ready to hear in 5th grade. Ms. Albert had brought a big bowl into class and filled it with water. We gathered around her desk and watched her drop a small stone into it. Tiny waves rippled out, away from the stone. This is what kindness does, Ms. Albert said. Each little thing we do goes out, like a ripple, into the world. At the end of each school day, have each student share a kindness. Through this activity, students become more aware of their choices and the impact they have on others. Sharing kindnesses is fun and promotes self-love as well. I enjoy seeing the pride on my students faces as they share, and I absolutely love the effect recognizing and sharing kindnesses has on the ambience of our room. I can’t believe I’ve never posted about Poetry in the Park before. If you have a nearby park or even a grassy area at your school to take your students, I urge you to provide your students with these outdoor writing experiences. I’ve read several articles about the importance and benefits of green space in learning, as well as how it can help students with distractibility. According to one article, “When kids with ADHD spend time outside or looking at nature, it increases their ability to pay attention and control their impulses”. Last year a like-minded teacher and I began bringing our students to the park once a month for an outdoor writing experience. 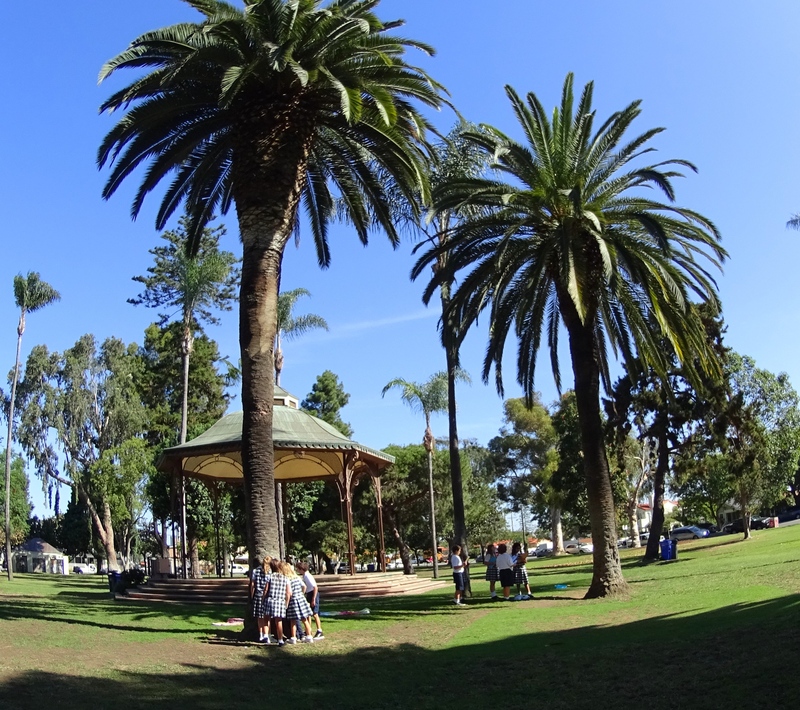 For these trips, we give a short mini-lesson in the classroom and then walk the students to a nearby park. Once at the park, they select their own personal space to work. They separate and set in on their assignment. Students love this writing experience and I do too, as it’s very rewarding to the students and teacher; the work they produce at the park is consistently astounding! Students are so engaged. 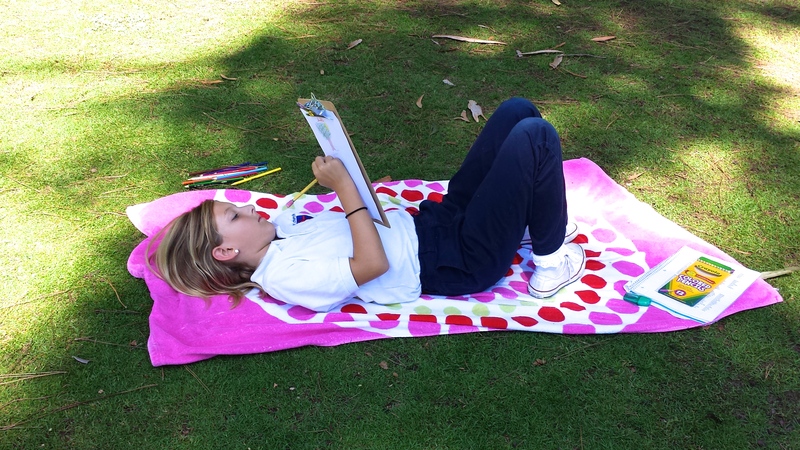 They’re encouraged to use their senses at the park to inspire their writing. 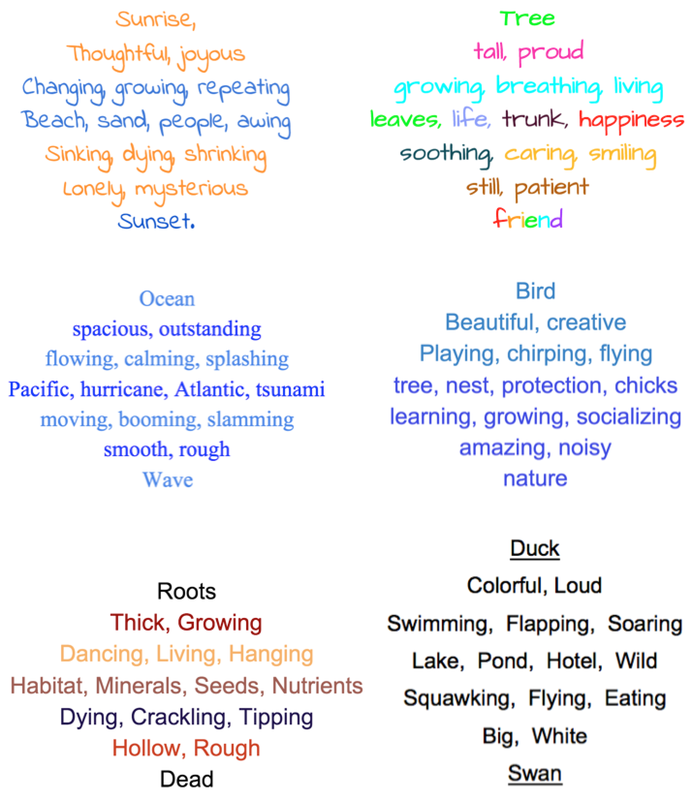 Each season, we complete seasonal “five senses poetry”. I’ll be sure to post about this later. This year, we’ve already written about Summer and we’ll be writing about Autumn next visit. 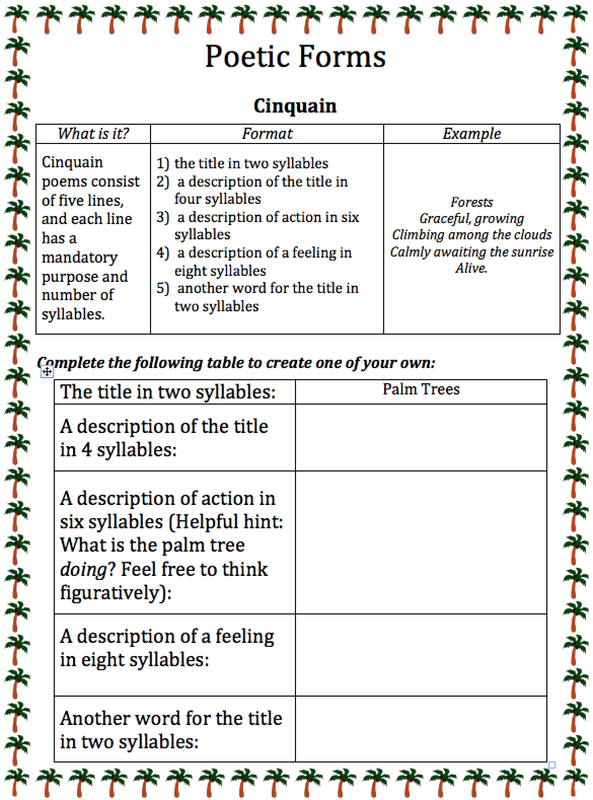 On our most recent visit we wrote cinquain, diamante and windspark poetry. Pairing our writing with our current Life Science unit, students focused on environmental topics and used their surroundings and what they’ve learned in Science to inspire them. I split my class in groups so they could each visit a tree to make observations. 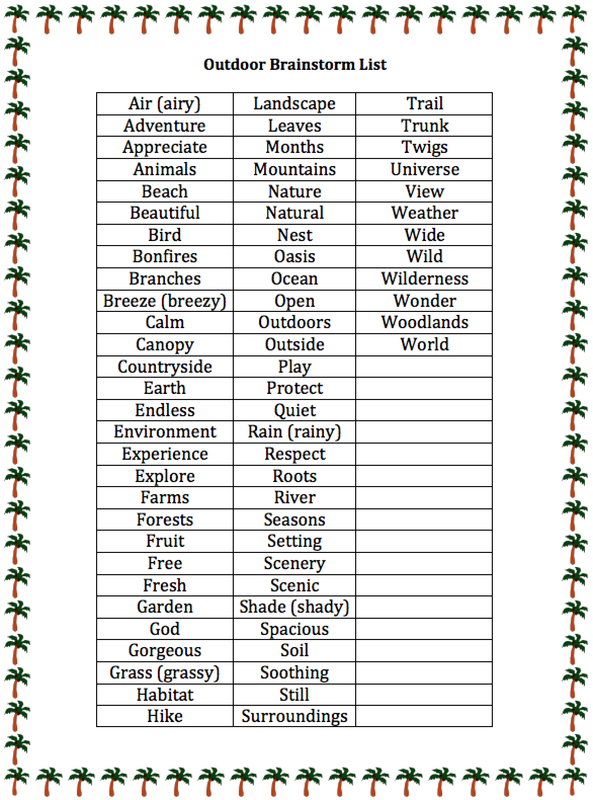 Together, they came up with a list of adjectives to describe their tree. We then split up into our individual spaces. We called this park session “Poet-Tree”. My class, investigating their trees. Here is my latest Poet-Tree in the park guide. I’ve provided screenshots, but you can download the document via a link at the end if you’d like. 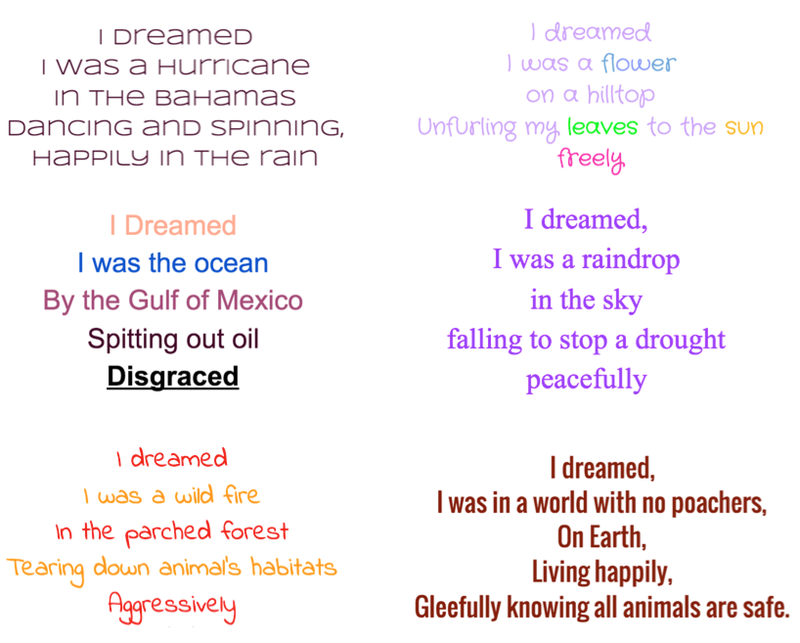 When finished, they went on to complete a diamante poem. They could choose to write about any environmental topic. 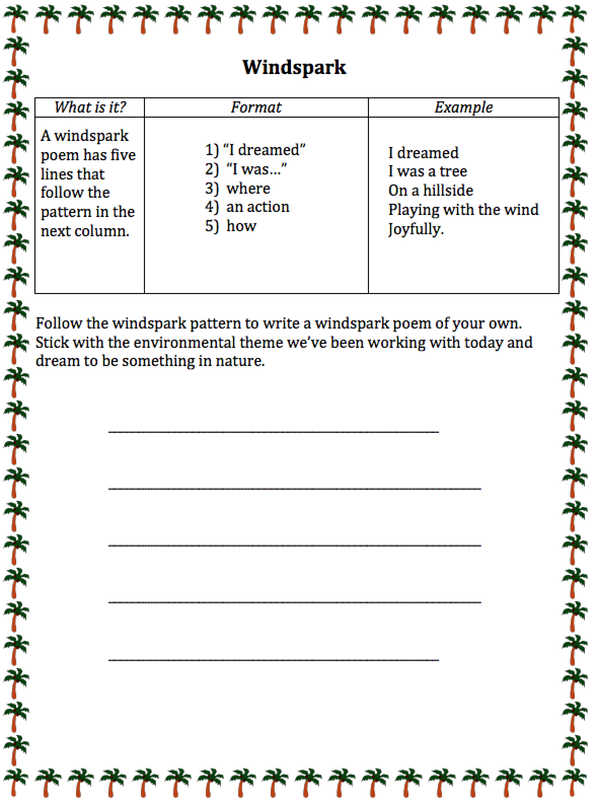 Finally, they worked on windspark poems, another poem of free choice, as long as it had something to do with the environment. These are my favorite! 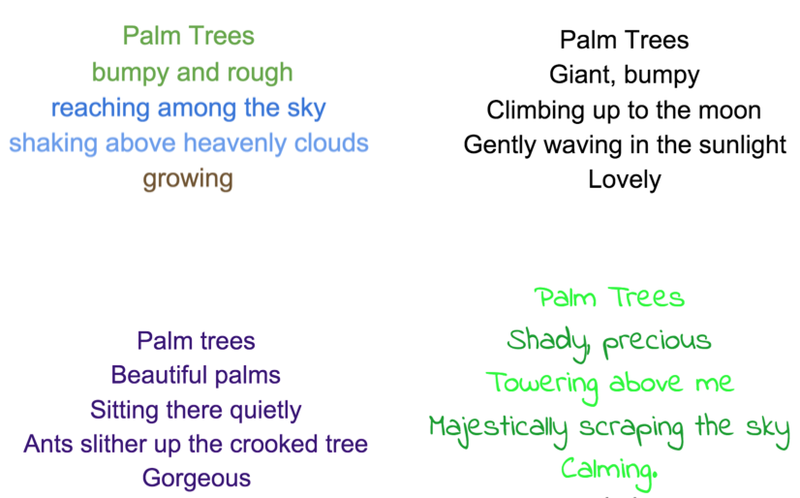 Before finding their own private space to complete their poetry and after completing tree brainstorming as a group, they received the following brainstorm list. 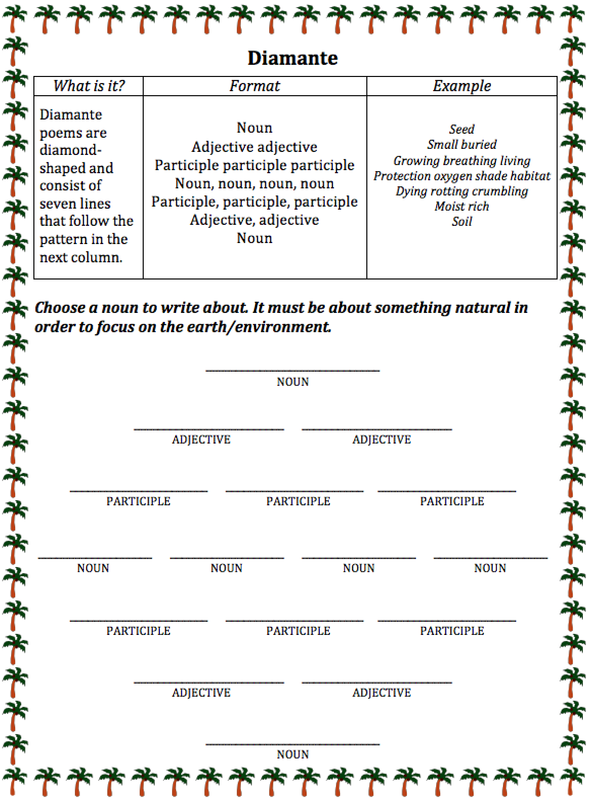 This was provided to help trigger ideas as students completed the diamante and windspark poems. 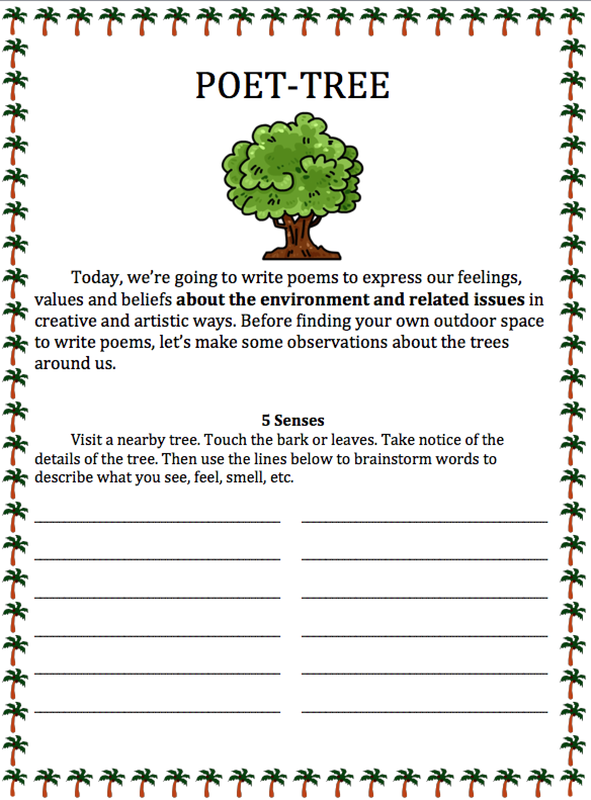 Click the following link to download this booklet – Poet Tree – 5th Grade. 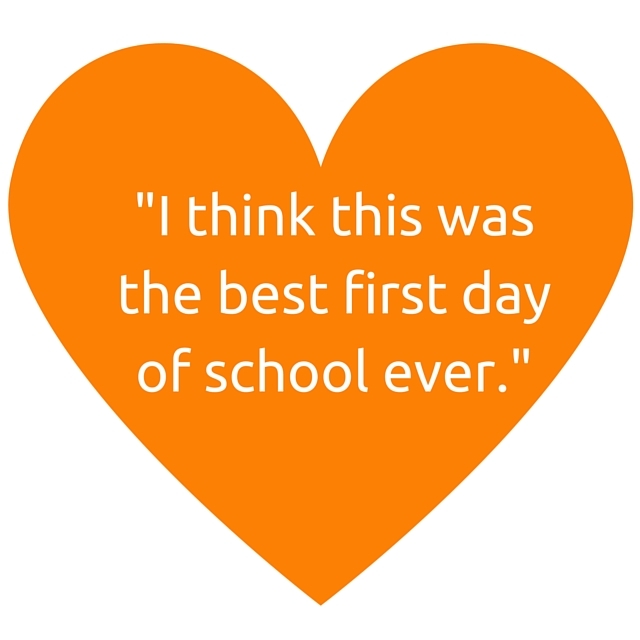 Today, when one of my students left for pickup, I overheard him sharing, “I think this was the best first day of school ever.” My heart warmed and it got me thinking…what was so different about this first day than those in his previous years? Well, traditionally, the first day of school for elementary students involves A LOT of listening – listening to the teacher introduce herself, listening to the teacher talk about the rules, listening to the teacher talk about the classroom and explain how it will operate, listening to explanations of procedures, etc. And let’s not forget the first day getting-to-know-you ice breakers. When I was younger, I dreaded the first day of school routines. Although I always felt ready for the first day and I was always eager to see my friends, I just wished I could skip the humdrum of the first day of school. In an effort to prevent my students from feeling as I did, I work to involve my students as much as possible on the first day of school (and always). I intentionally choose activities that get them up and out of their seats. Today was the first day of school for me and my 5th grade kiddos. At the end of the day, my students left the classroom with energy, excited and eager to come back for Day 2. They left with energy because they had a first day that included a lot of movement and they played an active role in getting to know the classroom. Instead of being talked at throughout most of the day, they were involved and responded to. The most successful and engaging part of the day was when my students toured the classroom. I recommend you give this a try! I begin by asking my students if they think someone would be able to learn about them if that someone visited their bedrooms. This leads to a great discussion about what we can learn about someone by noticing things around his or her room. We can learn about what they like, what they value or what they find important. I then ask the students if they think the same applies to a teacher’s classroom – do they think they can learn more about me and the classroom by looking around and making observations. They, of course, determine that they can. I hand my students a piece of paper and a clipboard. At the top of the page they write, “Observations:”, and about two-thirds of the way down the page they write, “Questions:”. Then, I explain that they will have the opportunity to tour the classroom. They, on this occassion only, are invited to open up any cabinets they’d like and look around. Besides the one locked drawer I have, everything is fair game. This alone excites them. I explain that I want them to make as many observations as they can and I want them to try their very best to come up with two questions. Now, they are allowed to talk during this activity, but for about 15 minutes my room was nearly silent. They loved it and were fully engaged! They really took their time to check things out thoroughly and had fun trying to guess the purpose for different things around the room. During this time, I didn’t answer any questions. I’d invite students to write them down and explained that we would get to them later. After about 15 minutes, I called my students back together. First, they shared their observations. During this time, I was also able to share expectations for group conversations without being preachy; it happens naturally as students discuss. Then, the best part! Time for questions. During this time, students will ask every question that you’d want to respond to in order to give them an overview of the room and your policies. The class eats this question and answer session up! Throughout it, they are smiling, laughing, and asking follow up questions. I believe they particularly like this activity because they own the time; they’re leading the questions and it makes them feel important. Really, they’re just giving me an opportunity to share all the information I’d want to share anyway, but now, they’re participants instead of recipients. It takes a maximum of two minutes to respond to any questions and then the floor belongs to the students again. 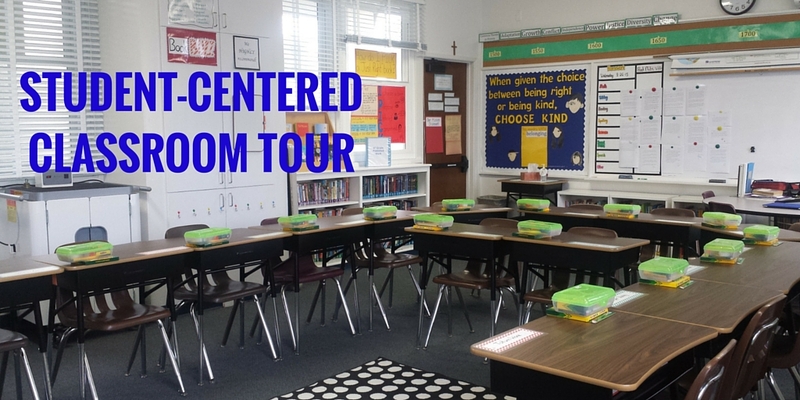 This student-centered approach to a typical first day energizes students. They also remember much more than when using the alternative approach – talking at the students as you go over the important first day info. Rather than getting that glossed-over-tired look, you get smiles, participation and ultimately, retention; they’re involved, so they remember. For those of you who haven’t yet had your first day, I wish you the best! Have You Discovered BiblioNasium Yet? I think I just found a gem. And I’m really excited about it. Really. I’ve done some exploring on the website, set up my own class and added a sample student so I could see how the site works as both a teacher and a student. In the past, I’ve encouraged my students to share book reviews on our class blog, but I think BiblioNasium is going to be better for a few reasons. BiblioNasium can keep track of all the books that students read during the school year, making it easy for me to view their progress and book interests. Students can view one another’s shelves. This means they can see which books their classmates have read during the school year and view their recommendations. Students can search specific books. If a classmate has written a review for the book, it will show up in the search. Using BiblioNasium will put all of my students book reviews in one place. It’ll make it easier for my students to share and recommend books to one another, and I’m pretty sure that it will be a motivating factor and feel a bit rewarding for students to add a completed book to a shelf. Anyone within the class can also send recommendations to each other. So, if you think a book would be fitting for another student you can recommend it to them and it will show on their “my recommendations” shelf. Pretty cool! In addition to organizing the books a student reads and recommends, the site can also be used for reading logs. Instead of paper logs, you can convert to digital. It’s easy for students to record their minutes and it can’t get lost. And it’s just as easy for the teacher to pull a reading log report. It looks like BiblioNasium is exactly what I was hoping to find. This year, I’ll be saying goodbye to the index-card review system and paper reading logs I’ve been using and giving BiblioNasium a try. Best of all, this resource is ad-free, kid friendly, and FREE! 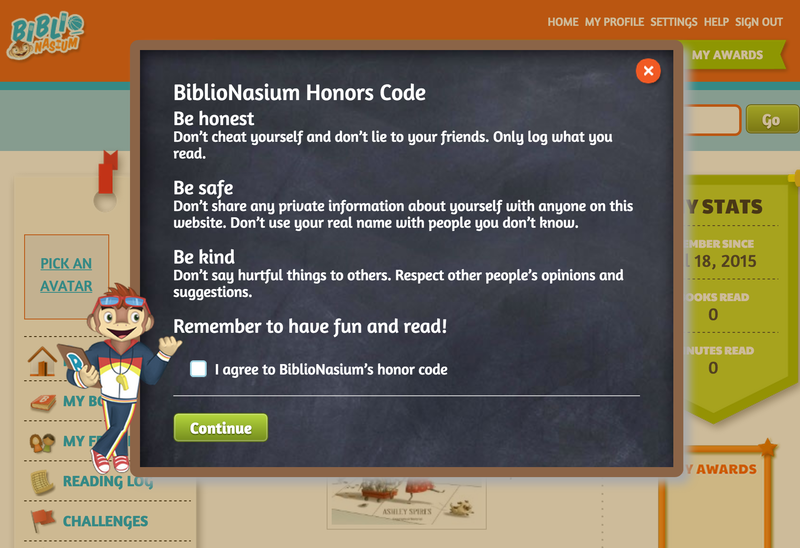 When students log into their accounts for the first time, they must read and agree to the BiblioNasium Honors Code. As I said, super kid-friendly, right? The honors code reinforces internet safety and proper online etiquette. I can’t wait to try it out this year. I’ll let you know how it goes! 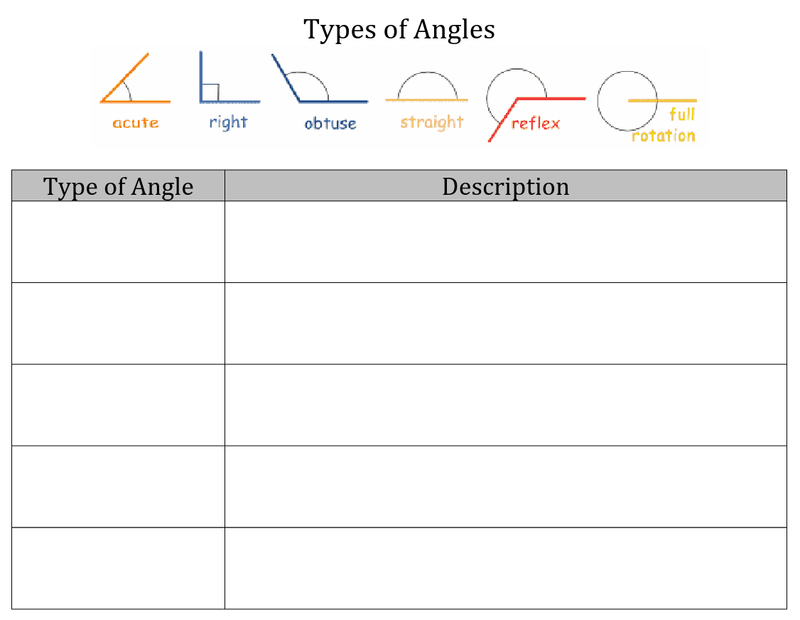 I use the following materials for my unit on angles. Scouring the internet to put these items together to engage your students can be a pain. Hopefully, if you’re a 5th grade teacher, this can be your one-stop-shop. I’ve listed the online resources that I use in my classroom (in the order that I use them) below. Before the start of our unit on angles, I ask students to label two pages in their notebooks “Angle Review”. We tape this table (pictured right) onto the second page. For homework, students review the Powerpoint (posted to Kidblog), copy the definitons and angle from Slide 2, and complete the table from Slide 3 of the Powerpoint. Here is a fun video I like to share to kick off the unit. The kids love it! Math Playground has designed a program that allows students to practice using a protractor and measuring angles online. Click here or on the image to try it out yourself. I particularly like that students are given immediate feedback and are able to remeasure and correct their answers. I use this activity along with the others listed in this section at a math station for extra practice after our first lesson in the angles unit.